This series of photos documents an important era in US military aviation history, especially activities of the US Air Force during World War II. Lt. Lemmon And Crew Of The 401St Bomb Group, Beside A Boeing B-17 "Flying Fortress" At An 8Th Air Force Base In England, 28 August 1944. 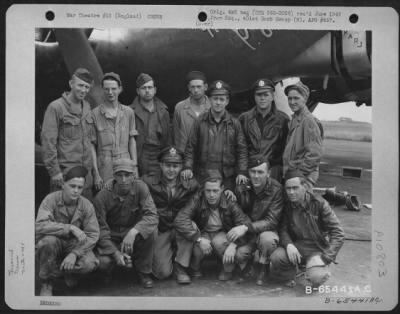 Original 4" x 5" from Headquarters, 401st Bomb Group (H), APO #557. View thousands of World War II era photographs of aircraft, equipment, air races, bombing tests, and military personnel - at work and play. Photos are grouped by regional "war theater" and then alphabetically by category, including subjects as diverse as recreation, rescue, aircraft, and miscellaneous. Each sub-category reveals intriguing captions further identifying the photographs.